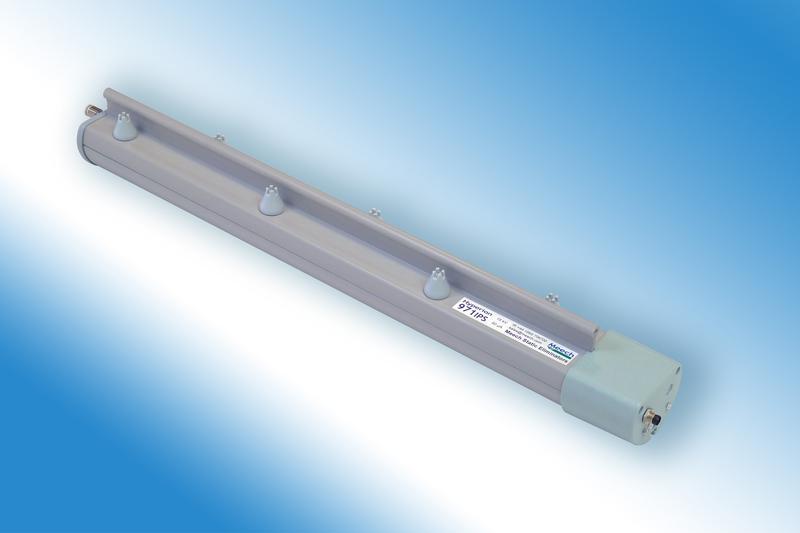 The Meech 971IPS-30 Extra Long-Range Pulsed DC Ionizing Bar is the latest addition to the Meech Hyperion Range. Ideal for applications in several industries, including labeling, the 971IPS-30 is the most powerful ionizing bar in the Hyperion range. With an operating working distance of 200 to 1500mm, the 971IPS-30 suits very long-range applications. As with the previous version of the bar, the 24V DC supply removes the need for high voltage wiring. Meech’s Ion Current Monitoring (ICM) technology ensures the performance of the bar is maintained with the aid of local and remote alerts, which indicate when the bar needs cleaning. The titanium emitters’ design allows them to be easily cleaned in situ and replaced when required, therefore preserving the 971IPS-30’s high quality performance over lengthy periods of time. The Hyperion BarMaster Remote Programmer can also be used to adjust the frequency and balance of the bar, optimizing it for any application.